We have been anticipating the hatch of the second clutch and noted a pip (first hole) in the light colored egg yesterday. It quickly became apparent however that the hatch of this egg was not proceeding normally. Peregrine falcon chicks hatch without any assistance from their parents, using a specialized egg tooth to score the inside of the shell and break free. In this case however, both the adult female and male used their bills to chip away at the opening. Both also seemed to picking at the contents of the egg. We were able to see movement from the chick inside the egg and the adults continued to incubate all four eggs. 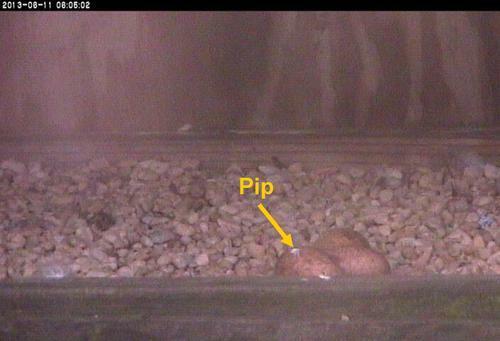 We also noted a pip in one of the other eggs. This morning revealed that the adults had removed the lighter colored egg from the nest box. We will continue to monitor the hatching progress of the remaining eggs. Eggs can fail for any number of reasons and the hatching process is grueling for the chicks. We do know that development of the embryo was relatively advanced as we could see chick’s bill (with the egg tooth).